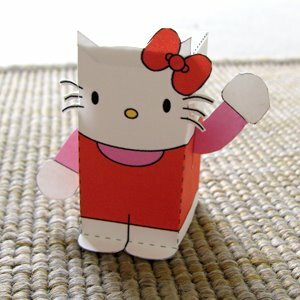 Hello Kitty is a simply drawn character who was created in 1974 by the Sanrio Company in Tokyo, Japan. It has been marketed in the United States from the beginning and has held the position of U.S. children's ambassador for UNICEF since 1983. The brand rose to greater prominence during the late 1990s when several celebrities such as Mariah Carey adopted Hello Kitty as a fashion statement. How cute! I would love to have this as a PDF to make it myself. can you send me this pdf?? Where can I find the PDF file ? i love to make things with paper, like origami and pdf to cut out fold etc... i have make some of yours figures!!! I love your internet page!! !